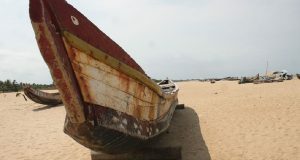 Addressing impact of development, natural hazards and climate change: Hɛn Mpoano’s work in coastal communities in the Western Region has included an innovative Rapid Assessment of the vulnerability and adaptive capacity of 77 coastal communities in Jomoro, Ellembelle, Nzema East, Ahanta West and Shama Districts. Detailed planning work was undertaken with some of the key communities which were identified as being most at risk. This has fostered a process of community action and interaction with District Assemblies to tackle the interrelated issues of increasing coastal poverty, livelihood insecurity and vulnerability in the context of accelerating change. Establishing enabling environment for sustainable fisheries development through creating stronger capability for fisheries co-management The 3rd national policy dialogue on fisheries governance held in 2013 provided new insights and momentum for strengthening the legal basis for co-managing a range of fisheries, and helps set the stage for the World Bank-funded West Africa Regional Fisheries Program (WARFP) now just underway in Ghana. Creating an emerging national –local partnership: The Hɛn Mpoano has successfully engaged with a wide range of collaborators at the national level to legitimize the learning-by-doing and participatory approaches to solving complex coastal issues at the community and district levels. USAID funding, and the partnership established with long-standing NGOs like Friends of the Nation has made this real change possible. Improving district-level planning: Hɛn Mpoano has been working closely with coastal communities since 2009 to identify and establish their needs in a process of ‘learning-by-doing’. Coastal management and fisheries related concerns now appear in District spatial plans and are currently being integrated into Mid-Term Development Plans. An innovative agreement to promote ecosystem-based management of Amanzule wetlands – shared between the Districts of Jomoro and Ellembelle – has been signed by key stakeholders, including traditional authorities and government leaders. Mainstreaming ICM at the national level: Acting upon the invitation of the NDPC while building on this unusually long period of intense ‘bottom-up’ working, Hɛn Mpoano provided input on the re-drafting of the Coastal and Marine Management sections of Ghana’s next ‘Medium Term Development Policy Framework 2014-17’ (MTDF 2014-17). This important guidance articulates the needs for ICM in the 26 Coastal Districts, which are home to over 25% of the country’s population. Piloting new national ICM guidelines in the Western Region The NDPC is taking a further step to carry ICM principles by agreeing to ask the six coastal Districts of the Western Region to pilot the implementation of ICM during 2014-17. The long term objective will be to extend ICM to the rest of the country under a proposed National Coastal Zone Commission.